There comes a point in your company's life cycle when times are tough. It could be the economy. It could be problems in your company's industry. It could be tough times in your company itself: the death of the founder, a fire in the factory, or an accountant who cooks the books. 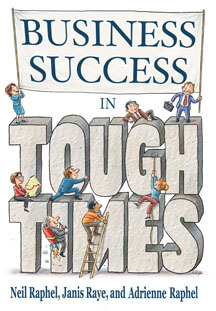 Business Success in Tough Times looks at business leaders and entrepreneurs who have shown the courage and will and brainpower to do well when other companies fail. From their stories, the book extracts nine characteristics of business success. "​Helpful for just about anyone who runs a business of any size." "I adore this book. It's chock full of very useful advice about how to communicate successfully for business people AND anyone! It should be required reading for every Fortune 500 CEO."